Hayloft books are printed with an environmentally friendly policy. The offset of carbon emissions is through support of Forest Protection in Pará, Brazil. 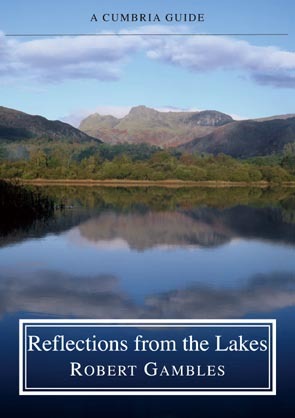 This book presents 38 fascinating reflections from the history and mythology of the Lake District. Robert Gambles writes eloquently and with a deep knowledge of his subject. The book includes chapters on Cumbria’s spa resorts, treacle mines, packhorse bridges, snuff manufacture, the eruption of Solway Moss, clock makers, outlaws of Inglewood Forest, wedding traditions, wild cats, ice-houses, and coffin routes over the fells. The ripples of national history are reflected in a chapter on the Dissolution of the Cumbrian Monasteries. The book ends with a fantasy tale of the Nine Standards involving the trolls of Norwegian folklore, followed by a ghost story from Martindale and a love story from Aira Force. Illustrated with 68 period drawings and etchings, plus black and white and colour photographs, this book offers an insight into many neglected or forgotten aspects of the Lakeland story and will be welcomed by any reader who loves Cumbria and its history. Robert Gambles was born and grew up in Derbyshire. He was a scholar of St John’s College, Oxford, where he took an Honours degree in Modern History and a post-graduate Diploma in Education. He also has a Licentiate Diploma in Music. His professional career was spent in Education, mainly in Ely and Liverpool. He acquired a love of the Lake District early in life and he has lived in Cumbria in his years of retirement during which he has explored the whole district and written a number of books and many articles on various aspects of its history. The author has also pursued his interest in a wider national history and a critical study of some of the well-known stories from British history was published in 2013 under the title Great Tales from British History, and was described by The Guardian as ‘hugely enjoyable’. Through his Norwegian wife he acquired a special interest in the life and history of Norway: Hayloft recently published his acclaimed Espen Ash Lad a collection of Folk Tales from Norway. A keen but pragmatic interest in conservation and the protection of the natural environment has always featured in his philosophy of life and he was for many years a Trustee and member of the Executive Committee of the Friends of the Lake District. He has also worked as a volunteer for the National Trust. Cover image and some photographs inside the book by Val Corbett.